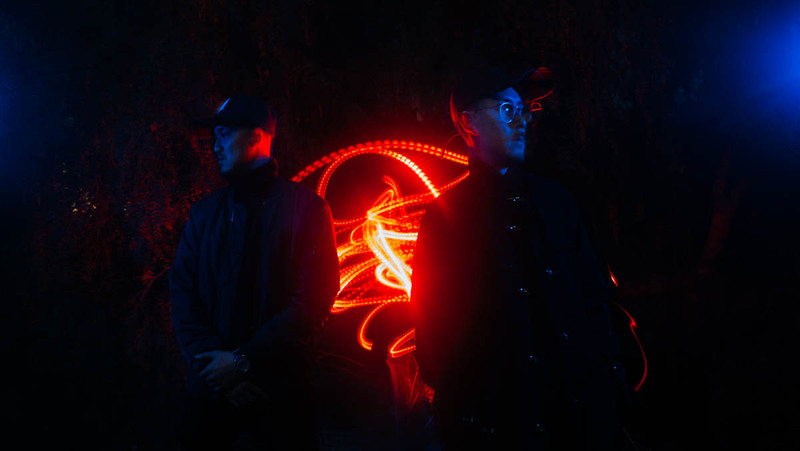 Los Angeles-based artist-producer collective MIKNNA, made up of rapper/vocalist Mike B. and producer/multi-instrumentalist Ken Nana, is creating something new in the electronic and hip-hop music scenes. Fusing retro synths and electronic beats with hip-hop vocals, MIKNNA (a fusion of Mike, Ken and Nana) and its “electro-soul” sound has brought them to Europe, Sweden and across the U.S. Though the pair have created music separately for years, their undeniable chemistry and creative bond shows their music has endless potential (it brought them to play their first music festival, Denver’s Global Dance Festival, in July). Korean American rapper Mike B. is no new face to the local Los Angeles music scene. Hailing from Koreatown, he gained traction through the APA talent show Kollaboration LA in 2013. And for half-Thai producer and multi-instrumentalist Nana, years of working behind-the-scenes as producer and beatmaker for other artists have given him years of practice. Two years ago, the duo got in the studio together and, after producing Mike B.’s solo album, found their sound. “‘NESS’ was our first song that we released and [realized] we need to form a duo because the chemistry was so right,” Ken explained. They decided to split everything “50|50” (also the name of their first EP) and began making music as MIKNNA. MIKNNA spoke with me on behalf of Kore Asian Media during their hometown show headlining the The Roxy Theatre in Los Angeles. How did you two initially meet and connect? Mike: Ken and I knew each other from a mutual friend and at the time, Ken was actually a creative and teaches at Apple … He helped edit the video I was doing (“Worth It”) and … fast forward four or five years, I was on a street in West LA and walked down the block and he happened to be skating down the street with another friend. Ken: Mike was at the point where he was working on a solo album at the time. I produced and made a lot of beats and worked with a lot of different R&B and rap artists, so he asked me if I wanted to do some tracks for [his solo project]. Once we saw each other on the street we were like, let’s go! Ken: After the first couple tracks we recorded together, we started to get a good groove and made one song, “Can’t Hold You” that was on our first EP (“50|50 (Side A)”). After that song we thought this sound is completely new. It didn’t fit with all the other songs that were on his album but we were like this is still dope. We started riding that wave and “NESS” was our first song that we released and were like alright, we need to form a duo because the chemistry was so right. From there we dropped everything we were doing. I stopped working with all the other artists I was with and was just like, let’s go in on it, fifty-fifty, everything we do. We got the whole family and NANA Lifestyle together (Ken and brother Sean Nana’s creative collective for music, video, design and photography production) to start a new artist from scratch [and] take all of the connects and things we’ve learned in the past [with] all these other artists we’ve worked with and experiences and [thought] let’s brand it, package it nicely and push it. That’s how we were able to get the momentum going right off the bat because the music was already there. It was all about putting it together. You describe your sound as “electro-soul.” What did you guys grow up listening to and how did you collaborate to create the sound you have now? Ken: I grew up around music because my dad was a musician. He’d always play guitar and drums, we had a drumset and guitar and an amp with a PA and a mic set up at our house growing up … I never trained or took any classes, I just watched him play with his band. He played a lot of classic rock, Beatles, Jimi Hendrix, Pink Floyd. That’s the type of music that was ingrained since I was young and before I developed my own taste in music. Growing up in LA I ended up surrounding myself with a lot of people who listened to hip-hop. I was a b-boy and breakdancer and listened to pop and Snoop Dogg and a lot of West Coast rap, Michael Jackson, The Neptunes and Pharrell. That was the taste I developed on my own and kind of the way we synced up. Mike: The Pharrell, early 2000s, late 90s R&B and hip-hop was the era that we grew up in [and connected]. For me I come from a more hip-hop background like Jay-Z, Nas, Tupac, but what really changed the trajectory when we got in the studio was that this guy [Ken] plays literally everything! So the possibilities of turning a record is limitless in the sense he could lay down the production, backbone, add keys, guitar. It’s very easy for me to apply myself in terms of vocals as an instrument. What are the things that you draw inspiration from when you’re writing and producing? Mike: With rap it was more personal history and background, but we [Ken and Mike] literally pull from each other [and] talk about things like relationships and whatever’s happening … With Ken, we sat down and asked ourselves what kind of records hold weight, whether you’re in the car or the club. Ken: Timeless, that’s the thing we want to be consistent with. Sometimes [a song] happens where we’re creating a beat and we’re like, “Damn what does this beat feel like?” And then we’ll start to think about concepts and ideas and go back and forth — just what the vision of the song is. Once we have a good foundation of the beat, I’ll hit record and have him go on the mic without writing anything and just freestyle melodies … It’s always the first take you hit record and the instincts come out and you get going. So you just released your newest single “MPH.” Tell me a little about that track and the production and inspiration behind that. Ken: We were just sitting in the living room and, I’m super into the eighties and analog and retro vibes, and I have this old 80s Roland synth [that] has a real kind of eighties feel. I was messing with the main chord line that is now “MPH.” We recorded that and built the rhythm behind it, added some drums. It just started to shape itself. We weren’t even making music, didn’t schedule studio time. We were just chilling in the living room and it just happened to come up. From that point we just kept working on it and dropped everything that we were doing. When I first listened to “MPH,” it felt very nostalgic. You mentioned you want your music to be timeless and it has that quality. Ken: I kept in mind with the production [that] I wanted it to be that something I could eventually have a full band to play all the parts where it’s not too many crazy, trippy electronic sounds. Like, this is just the foundation — you have chords, you have a bass line, drums and a guitar. It’s really simple but I was thinking about the evolution of our live shows [to] start to bring a full band together and have them play it and make the record live. But it’s really unique with us being a duo. A full band can sometimes take away from the production and from the ways that the record sounds. You can’t reproduce a lot of the sounds that are on our catalog, some of it just has to be electronic or played back. How do you think your Asian American identity has played a part in your music or being in this industry? Mike: When we approached [this], we thought … in terms of photography and branding and aesthetics. Ken really drew from a lot of eighties stuff that he likes, the darker moodier stuff, so when we did it, we didn’t want people to look at us and be like, “Oh you’re two Asians doing music.” We wanted to have the music speak for itself. Ken: It’s a little more mysterious … A lot of our good friends are all Asian American artists that are killing it in the Asian scene [but] the sound and the feel that we have, we’re not trying to attach it to a race. We want to attach it to a feeling and almost build a character. We’re super inspired by Daft Punk — the mystery behind Daft Punk and the artistry behind who they are, what they do … It’s cool to see people like our music first and then see that we’re Asian and that makes them like us more. That’s the type of s–t that I like. What can we look forward to from MIKNNA? Ken: As far as music, we’re writing a lot music. We’re gonna focus on pushing all the music that we’ve been putting out and getting out in front of more people. We have music and videos that we’re waiting to release, just timing things out right. We’re independent so everything is all on us. The blessing we have is we get to decide when or what we want to put out, but it’s also hard because we’re competing with people who are signed by majors that have big budgets and could pull strings and have their networks already on lock that we have to kind of kick the door down. Mike: That’s the fun part though. Ken: You know, small and mighty! Be sure to look out for more music and stay updated with MIKNNA at miknna.com. This article was featured on kore.am.